Is past opposition to LGBTQ rights now the third-rail for Democrats? Tulsi Gabbard has a problem and she knows it. Within a week of the Hawaii Congresswoman launching her presidential campaign, she had to issue not one, but two apologies. The initial statement obviously didn’t cut it, so Gabbard issued a video apologizing for her past anti-LGBTQ comments. Gabbard goes on to talk about growing up in a socially conservative household, headed by her father, Mike Gabbard, who successfully led the fight to stop marriage equality in Hawaii in the 1990s. She also cites her own experience as an example that people can change for the better. What Gabbard is running into is the reality of Democratic party politics. It’s no longer acceptable for a high-profile Democrat to be nebulously supportive of LGBTQ rights. You better have a strong track record, and if not, you better be able to explain quickly how you’ve changed. Of course, Gabbard is an extreme case. She was talking about LGBTQ rights the same way that Franklin Graham or Tony Perkins would. She railed against “homosexual extremists” and once worked for a group that touted conversion therapy. That stance is far more radical than that of a standard-issue moderate Democrat who may have favored civil unions instead of marriage. Still, the lesson for other candidates is clear: if you have anything in your past that doesn’t pass 2019 standards of support for LGBTQ rights, you better get ahead of it when you announce. 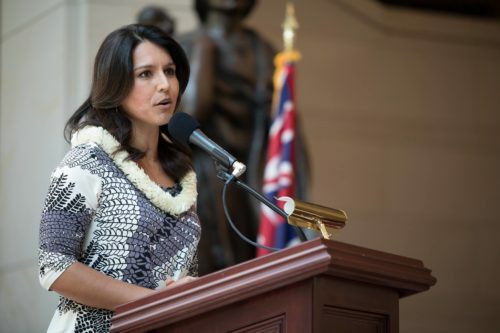 Gabbard’s big mistake was to let journalists call out her past remarks for her. That left her on the defensive and scrambling to respond. Openly gay Rep. Sean Maloney provided some cover as the controversy grew by offering words of support. Gabbard needs that kind of cover, not just for her presidential campaign but to continue as a player in Democratic politics. If you think that failure to support LGBTQ rights isn’t a third rail for Democratic candidates who want to be president, consider this: Gabbard has taken plenty of other problematic stands, starting with rhetoric about Islam that sounds a lot like the way Republican hawks talk. Her position on Syria is far outside the party mainstream. She has been supportive of Russians intervention on the ongoing crisis there and even met with Syrian dictator Bashar al-Assad, who has engaged in chemical warfare and endless atrocities against his own people. So it’s interesting, to say the least, that with such a checkered record Gabbard vulnerable spot has been LGBTQ issues. That’s a sign of how much the party has decided that the community is a key component of its base. For the 2020 campaign, that’s good news. The distinction between Trump and whoever his Democratic opponent is will be extra sharp. The big challenge for Democrats–Gabbard included–will be what they will be able to deliver even if they win.